UPDATED 9/2/18 8:26PM: To note others endorsements of Edwards. DEERFIELD—About 41,000 people per state House district, as of the 2010 Census, can seem like a lot. 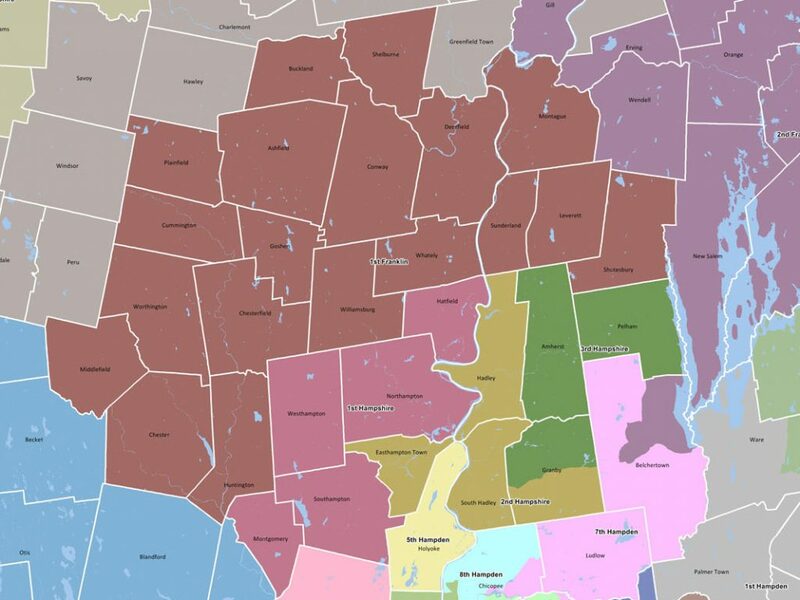 It’s the population of Holyoke or Westfield—who have their own individual districts. But the 1st Franklin has 19 towns. That is not very many people per town. These are large spaces that have their own needs and idiosyncrasies to administer. However, for Jonathan Edwards that uniqueness is familiar. 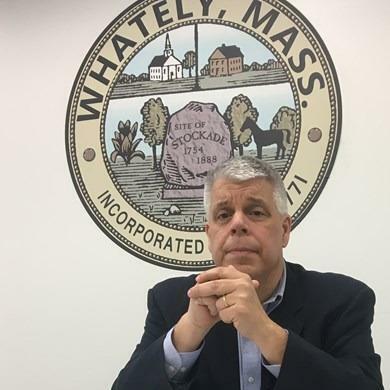 A Select Board member in neighboring Whately, he is one among the herd of candidates competing to succeed retiring state rep Stephen Kulik. He argues the 1st Franklin needs somebody who can explain the concerns of small towns in the district to deliver results on Beacon Hill. The 1st Franklin House district’s cast of characters includes towns of Ashfield, Buckland, Conway, Chester, Chesterfield, Cummington, Deerfield, Goshen, Huntington, Leverett, Middlefield, Montague, Plainville, Shelburne, Shutesbury, Sunderland, Whately, Williamsburg, and Worthington. In addition to the Whately Select Board, Edwards serves as president of the Franklin County Select Board Association. Although Edwards had a career in the solar industry, he currently in workforce development at the Tech Foundry, a training and workforce development hub in Springfield. With such a large and diverse field to fill Kulik’s seat, it can be hard to stand out at times. Edwards has been betting his background and willingness to tackle the thorny issues towns’ quasi-executive select boards will earn voters trust. However, Edwards may also be offering a subtler, but no less important pitch: regionalism. That is partly realpolitik. There are 19 towns in one district. Yet, it may reflect his broader view that economic development is a regional effort. His focus may be the 1st Franklin, but it’s an endeavor that extends throughout the 413. “A weak economy in Springfield means a weak economy in the Pioneer Valley,” Edwards said. 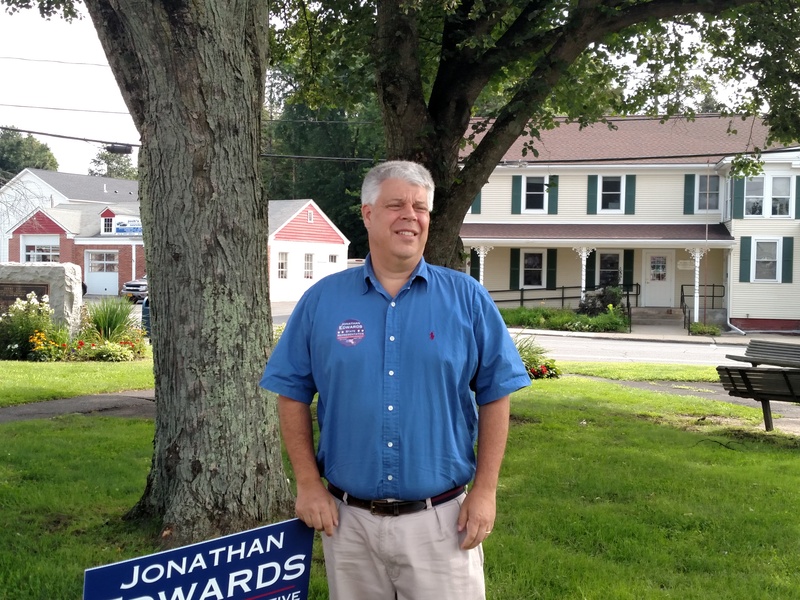 During an interview at Jerry’s, a breakfast nook in Deerfield, Edwards emphasized that state government must take a different approach to address the 413’s economic weakness relative to Boston. Edwards posits that Western Massachusetts is blessed with its diversity of landscapes, but faces specific challenges developing a new economy. Although the Economic Development secretary Jay Ash and his predecessor Greg Bialecki were present and sympathetic, state government, broadly, has not delivered a solution for rural Massachusetts. Supporters are confident in his ability to speak on the region’s behalf in the legislature, too. Scott Cote, the Franklin County Register of Deeds, has known Edwards for years, mostly through kids’ baseball programs. While his office actually falls under the Secretary of State’s office, it is important to have an advocate who understands how the region’s needs differ. “It’s nice to have a legislator to going to bat for you, local towns, small towns, rural county.” Cote said. In addition to Cote, Edwards has received endorsements from fellow Select Board members in Leverett and Sunderland. Within the district, Edwards noted that the town he serves has an advantage other 1st Franklin towns do not. Whately is accessible to I-91 and the jobs centered in and around Amherst. For those that are not so close to the region’s economic centers, such as they are, towns are suffering from the twin demons of economic stagnation and burgeoning expenses. They aggravate general demographic trends in Western Massachusetts. Indeed, the population is aging or in decline. One solution, he suggests, is to simply make education better here. Regional school districts that crisscross the 1st Franklin, must draw young families will move here. But that will require, among other things, investment in broadband and release of financial pressure. Like many of the candidates in this race, Edwards noted soaring regional school transportation costs. Over the 14 budgets he’s helped assemble, the cost of busing students—which the state is supposed to finance—has gone up and up. Asked why it remains a perpetual problem, he pointed to the opacity of the legislature’s budget process. Still, Edwards is trying to sell a pragmatism that accepts the difficulty and complexity of issues. Throughout the interview he observed making progress would take time. For example, Edwards supports single payer healthcare. The existing system is busting town budgets and doing nothing to make care accessible in low-density places like the district. “The conversation has to move from if to how,” he said. “We haven’t really had a conversation to how.” But it is going to be a long process to figure out how to make it happen, he warned. This approach goes with what Edwards says is his willingness to wade into the morass of finding solutions. He points to Whately’s regionalization of ambulance services as an example. It was a complex and fraught issue. Edwards indicated it could have advanced without much conversation and debate, but that would have risked running aground problems later. It was an issue that that had riled Whately for years. Nonetheless, that Edwards took it on doesn’t surprise supporters. “Jon doesn’t typically shy away from a tough decision,” Cote noted. The same will apply things voters want in the 1st Franklin. In a fractured primary field, anything can happen. Who is and isn’t a frontrunner in this race is hard to adequately assess. All that is left is persuasion. Can Edwards convince voters, roused by national events, that his approach is best? It’s a tough bet in these times. Though patience could help counter demands for instant gratification that infect even politics.